The Fort Moultrie Flag was created by Colonel William Moultrie when he was ordered to take over Fort Johnson on James Island in Charleston Harbor, South Carolina in 1775. The South Carolina Council of Safety wanted to salute the British warships in the harbor with a flag to show them they were now in possession of the fort. Colonel Moultrie created this flag for the purpose. It was the first United States flag flown in the south. In September of 1775, the South Carolina Council of Safety was growing more and more concerned with patrolling British warships in Charleston Harbor. The entrance of the harbor was guarded by Sullivan's Island on the north and James Island on the south. To try to get a better defensive position to guard the harbor, the Council of Safety ordered Colonel William Moultrie to take Fort Johnson, on the edge of James Island, and the small contingent of British soldiers who manned it. Col. Moultrie sent Captain Charles Cotesworth Pinckney, Captain Bernard Elliott and Captain Francis Marion with 50 men each to take the fort. On the morning of September 15th, they rowed to the island, but were surprised to find the gates open and the fort abandoned. The British had apparently been warned an expedition was planned against the fort and they had removed all of their guns and cannon. Only 5 British soldiers remained who were then captured. Before long, the patriots had mounted their own cannons to defend the fort against British warships. Later that day, the British sloop-of-war Cherokee arrived off Fort Johnson. Out of pride, the Council of Safety wanted to signal the British ship that they were now in possession of the fort. 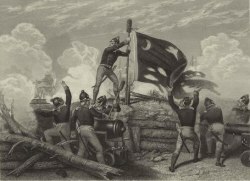 Since there was no official United States Flag or South Carolina Flag at this point, they instructed Col. Moultrie to design a flag and hoist it above Fort Johnson. Moultrie designed a blue flag with a white crescent moon in the canton with the word "Liberty" on the moon. A form of this design dated back to the 1765 Stamp Act riots when South Carolinians protested the act under a blue flag with three crescents in the canton (the upper left corner). Keeping with this theme, Moultrie's South Carolina regiments wore blue uniforms with a silver crescent on their caps and the words "Liberty or Death." Moultrie chose the design to honor his soldiers and continued the tradition of using the crescent as a symbol of resistance to tyrannical rule. This flag became known as the Fort Moultrie Flag and was the first US flag flown in the south. It also became the flag of the South Carolina Minutemen. The patriots were ecstatic with the hoisting of the Fort Moultrie Flag, but there were some among the soldiers who were still hoping for a peaceful end to conflict with Great Britain and they were upset when the flag was raised. They believed Captain Thoroughbred on the man-of-war Tamar, would look at the flag as an insult and an act of defiance that would make him attack the fort, but he never did. In March 1776, Moultrie's troops began building Fort Sullivan on the southern tip of Sullivan's Island to further defend the entrance to Charleston Harbor. They built a wall of palmetto logs and sand that was far from finished when a British fleet from the north arrived on June 1. The British Army had been confined in Boston during most of 1775 due to the colonists surrounding the town. General Henry Clinton needed to secure bases of operation where the British army would have more control, so he decided to launch an offensive against the southern colonies. Ten warships sailed to Charleston and began a bombardment on Fort Sullivan on June 28, 1776. Once again, the soldiers raised the Fort Moultrie Flag, designed by Col. Moultrie. The bombardment lasted throughout the day. In his memoirs, Moultrie later wrote that it was like "one continual blaze and roar; and clouds of smoke curling over... for hours together." The British warships had 300 cannons between them, but remarkably, the furious cannonade against the fort did little damage because the soft palmetto logs tended to absorb the force of the balls like a sponge. The sand absorbed the rest of the impact. During the bombardment, the pole holding up the Fort Moultrie Flag was broken by a cannon shot and the flag fell down outside the fort. Sergeant William Jasper, an illiterate youth, ran outside the fort for the flag, risking death from the bullets and cannon balls flying all around him, allegedly crying, "We cannot fight without a flag!" He replanted the flag on the walls of the fort, earning him a place of reknown in the American Revolution. Col. Moultrie's troops acted patiently and with precision fired back their own cannon at the ships facing them in the harbor. They severely damaged most of the ships, while a few grounded themselves on the sandbars. Finally, Sir Peter Parker, commander of the fleet, who was injured in the battle, called off the attack and retreated. It took Parker 3 weeks to repair his ships, at which point the fleet abandoned the southern campaign and sailed for New York. In the battle, the British warships lost 220 men dead or wounded, but the colonists lost only 12 men with 25 wounded, even though they were outnumbered 5 to 1! The Battle of Sullivan's Island was a decisive victory for the colonists because it kept the British out of the south for another three years. It was the first major defeat at sea for the British in many years. Many loyalists in South Carolina changed sides and joined the patriots as a result of the victory, no longer afraid of the British army. The battle was fought less than a week before Congress' Declaration of Independence from Great Britain. Fort Sullivan was renamed Fort Moultrie in honor of Col. William Moultrie who commanded the battle and this is how the Fort Moultrie Flag got it's name. 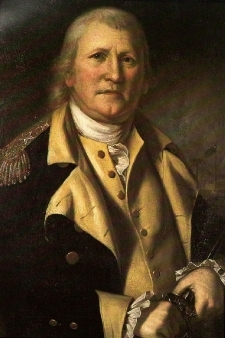 Col. Moultrie was promoted to General and his troops joined the Continental Army. John Rutledge, president of the South Carolina Assembly, presented Sergeant William Jasper with his dress sword and an officer's commission, but Jasper turned down the commission, believing it was inappropriate for a man of his low social status. The painting, The Battle of Fort Moultrie, above, was presented to the United States Senate in 1901 by Octavius White. White's father John Blake White painted the painting in the early 1800s. It shows the view from inside Fort Sullivan, later renamed Fort Moultrie. In the lower right corner are Colonel Moultrie, Colonel Francis Marion and others. This is the same Francis Marion known as the "Swamp Fox," on whom Mel Gibson's character in the movie The Patriot is based. Along the wall in the center of the painting, one of the men is Blake Leay White, the artist's father, who is believed to have participated in the battle. Blake Leay White and Francis Marion owned adjoining plantations and when the artist was a youngster, he would sit on Marion's lap when visiting. 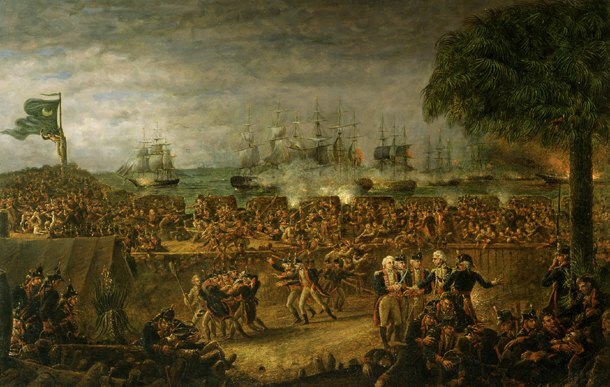 At the top left of the painting, you can see William Jasper guarding the Fort Moultrie Flag flying over the fort, the British ships firing their cannons in the background. Today, the flag of the State of South Carolina, is based on the Fort Moultrie Flag. It is exactly the same as the original Fort Moultrie Flag, except that the word "Liberty" is removed from the crescent and it has a Palmetto Tree added in the center of the blue field. The Palmetto Tree was added by the state during the Civil War. Several variations appeared during that time, but the version with the palmetto added, to represent the palmetto logs that were used at Fort Moultrie, is the one that survived as the official flag of South Carolina. The correct version of the Fort Moultrie Flag has the word LIBERTY on the moon itself. 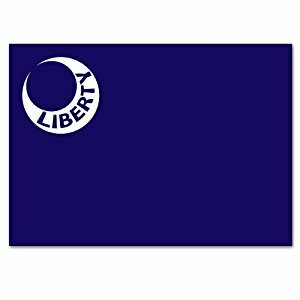 Another flag is commonly sold as the Fort Moultrie Flag with the word "Liberty" at the bottom of the blue field, instead of in the moon. This is not an historically accurate flag, even though it is sold this way by many flag dealers. Probably the flag's description was misunderstood by someone saying the flag is a "blue field with a moon on the canton and with the word liberty on it." They took the "it" in the description to mean the flag, rather than the moon. The error may have first appeared in a text book or a book on historical flags that was viewed as authoritative and was then reproduced by others. This version of the Fort Moultrie flag was adopted as the civic flag of the town of Liberty, South Carolina. Order your very own Fort Moultrie Flag here and help support this website with your purchase.